Where Does the Carbon Dioxide Really Come From? Professor Ian Plimer could not have said it better! If you’ve read his book you will agree, this is a good summary. PLIMER: “Okay, here’s the bombshell. The volcanic eruption in Iceland . Since its first spewing of volcanic ash has, in just FOUR DAYS, NEGATED EVERY SINGLE EFFORT you have made in the past five years to control CO2 emissions on our planet – all of you. Of course, you know about this evil carbon dioxide that we are trying to suppress – it’s that vital chemical compound that every plant requires to live and grow and to synthesize into oxygen for us humans and all animal life. I know….it’s very disheartening to realize that all of the carbon emission savings you have accomplished while suffering the inconvenience and expense of driving Prius hybrids, buying fabric grocery bags, sitting up till midnight to finish your kids “The Green Revolution” science project, throwing out all of your non-green cleaning supplies, using only two squares of toilet paper, putting a brick in your toilet tank reservoir, selling your SUV and speedboat, vacationing at home instead of abroad, nearly getting hit every day on your bicycle, replacing all of your 50p light bulbs with £5 light bulbs ….. well, all of those things you have done have all gone down the tubes in just four days. 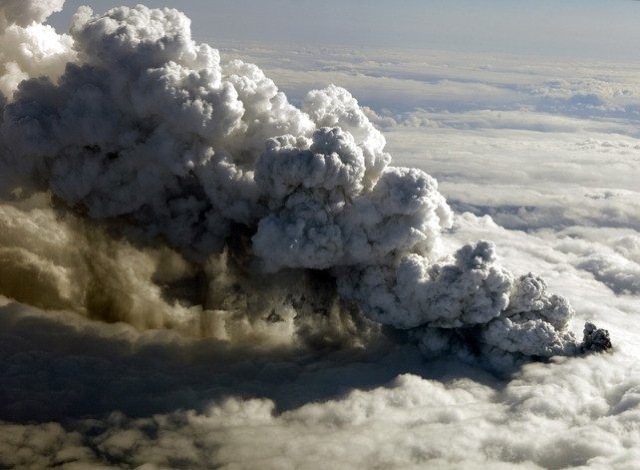 The volcanic ash emitted into the Earth’s atmosphere in just four days – yes, FOUR DAYS – by that volcano in Iceland has totally erased every single effort you have made to reduce the evil beast, carbon. And there are around 200 active volcanoes on the planet spewing out this crud at any one time – EVERY DAY. I don’t really want to rain on your parade too much, but I should mention that when the volcano Mt. Pinatubo erupted in the Philippines in 1991, it spewed out more greenhouse gases into the atmosphere than the entire human race had emitted in all its years on earth. Yes, folks, Mt. Pinatubo was active for over one year – think about it!!!! Of course, I shouldn’t spoil this ‘touchy-feely tree-hugging’ moment and mention the effect of solar and cosmic activity and the well-recognized 800-year global heating and cooling cycle, which keeps happening despite our completely insignificant efforts to affect climate change. Just remember that your government just tried to impose a whopping carbon tax on you, on the basis of the bogus ‘human-caused’ climate-change scenario. Hey, isn’t it interesting how they don’t mention ‘Global Warming’ anymore, but just ‘Climate Change’ – you know why? It’s because the planet has COOLED by 0.7 degrees in the past few years and these global warming bull artists got caught with their pants down. And, just keep in mind that you might yet have an Emissions Trading Scheme – that whopping new tax – imposed on you that will achieve absolutely nothing except make you poorer. It won’t stop any volcanoes from erupting, that’s for sure.